For December, the imaging object of the Month could be any number of goodies in Orion or neighbouring Monoceros. So it could be M42 the Great Nebula in Orion, or the nearby Horsehead region lying close to the brilliant belt star Alnitak. Moving eastwards towards Monoceros we have the Cone nebula and Christmas Tree cluster, and again nearby we have the fabulous Rosette nebula. Any one of these remarkable deep-sky objects would make a suitable “Imaging Object of the Month” – but for this year I have chosen Caldwell 49 which is also known as the Rosette nebula, NGC2237, the Great Nebula in Monoceros, or Swift’s nebula. The Rosette nebula is a huge region of emission nebulosity with a very nice open cluster, NGC2244, lying at its centre. Lying at a distance of nearly 5,000 light years in Monoceros, the Rosette nebula is a challenging target mainly due to its large size. The huge field of view of the Sky 90/SXVF-M25C combination at 3.33 x 2.22 degrees, only just manages to contain the Rosette in the smaller axis with the open cluster centred in the frame. 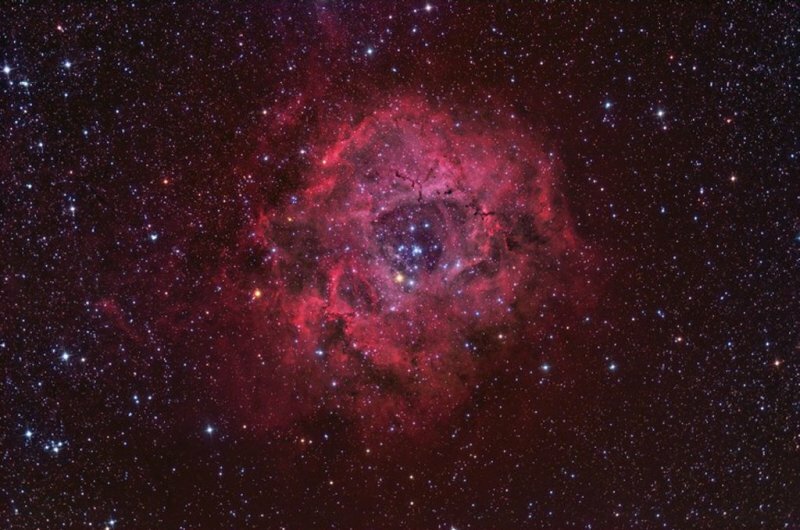 There is a very long entry on the Rosette nebula in Stephen James O’Meara’s “The Caldwell Objects” which is well worth a read. I recommend RGB, H-alpha and OIII data combined, totalling from 12 to 15 hours for a really nice image of this spectacular region of space. The image below was creates using around 5 and a half hours of RGB data in 15 minute sub-exposures and 4 hours of H-alpha data using 20-minute sub-exposures both using the Sky 90/SXVF-M25C combination at f#4.5. Being an emission nebula, this object benefits greatly from the H-alpha subs, and would also respond well to OIII narrowband imaging, but I didn’t have an OIII filter when this image was taken in December 2006. Now that I have an OIII filter (purchased from Ian King imaging for the 2-frame Veil Nebula project) I will add in the extra OIII data on the Rosette this year, providing we get some clear skies.